We set off to discover the places that have made Rome a holy city par excellence, a destination for pilgrims and visitors from around the world who come to see its masterpieces. Transfer to Rome by private train "Roma Express"
Our experience starts at the port where we board the "Roma Express" vintage train that is reserved for cruise liner passengers. This train will take us to the eternal city in comfort in a relatively short time. When we arrive in the city centre we board a coach for a panoramic tour of the historic centre of the city that will take us through some places of universal renown such as Trastevere, paved with cobblestones, the Janiculum, which commands one of the most evocative panoramas of Rome, the Pyramid of Cestius and the Baths of Caracalla which are among the best preserved from the Roman period. 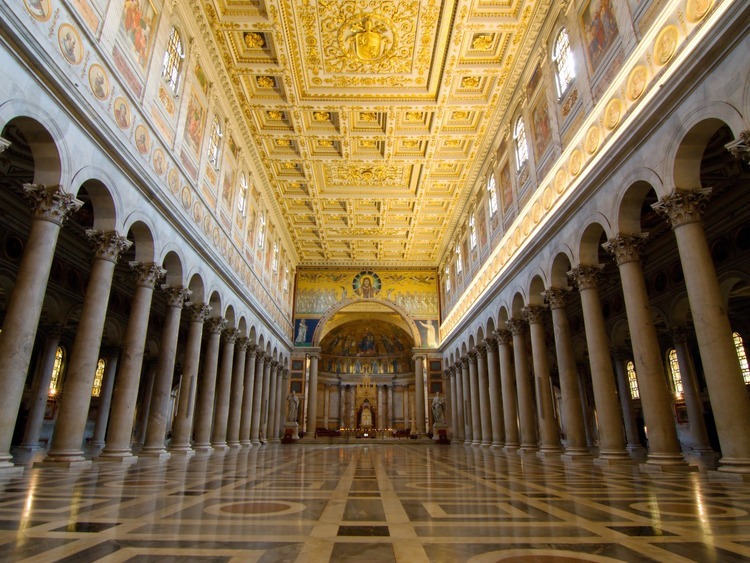 In the vicinity of the Caelian Hill, we leave our coach to visit St. John Lateran's Basilica, the oldest church in Rome and one of the four patriarchal basilicas. When we enter we discover the masterpieces and secrets of this wonderful church, including the 'Altar of the Blessed Sacrament, on top of which there is a reliquary with a fragment of the table on which Jesus shared the Last Supper with the apostles. The entrance to the Holy of Holies Chapel, which is open for the first time to Costa visitors, an exclusive arrangement in the Italian cruise liner market, will give us access to one of the most holy places of Christianity. We experience a unique emotion as we enter the Pope's private chapel to see and venerate the precious relics there are inside including an antique icon of the Redeemer that is defined as an Acheiropoieta, a Greek term that means "made without hands". The work was commissioned to St. Luke, but when the apostle was about to start working on it the painting materialized by itself, created by angels' hands. Next to the chapel we can see the Holy Stairs, 28 steps that, according to tradition, Jesus ascended to go to Pontius Pilate during his trial. It is said that the marble steps were transported from Jerusalem to Rome by St. Helen, Emperor Constantine's mother. After this extraordinary visit we are ready to savour a tasty lunch in a typical Italian restaurant. We board the coach again and head for St. Peter's Basilica, the biggest Christian church that has ever been built, located on the tomb of St. Peter. It overlooks St. Peter's Square which is famous the world over for its elliptical colonnade designed by Bernini. Here our guide gives us some interesting information before leaving us some free time to observe this symbol of Christianity from the exterior. The excursion ends with a pleasant walk back to San Pietro railway station where we catch the Roma Express train back to Civitaveccia. The transfer to Rome takes approximately 1 hour. Comfortable shoes are recommended. Dress code that is appropriate for the places of worship to be visited is recommended. Due to new security control procedures many tourist sites may have long queues even for booked groups. On Wednesday morning St. Peter's Basilica could be closed due to the Papal Audience. In case of extraordinary celebrations, the surrounding area could be overcrowded causing long queues at the entrance of the Basilica. ?